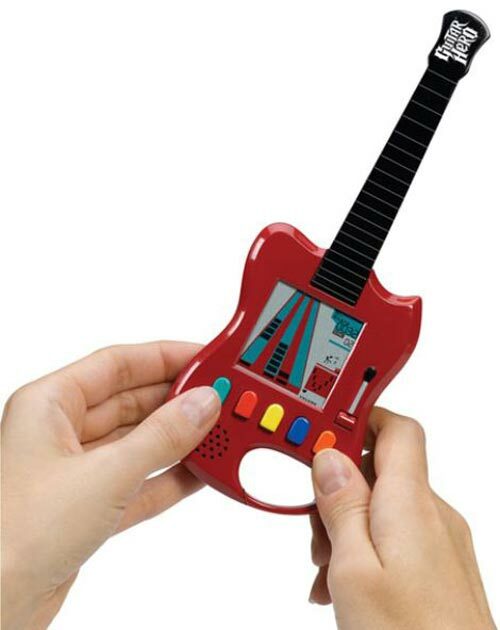 Check out this pocket Guitar Hero Arcade Game. It measures 7 3/4 inches x3 inches, and the neck of the guitar is foldable so you can easily fit it in your pocket. It has a built in LCD which shows you the targets for each songs. Songs on the game are ¢â‚¬Å“Smoke on the Water, Rock this Town, Cherry Pie, Killer Queen, Youve Got Another Thing Comin, Miserlou, Heart Shaped Box, Message in a Bottle, Jessica, and Surrender. It will go on sale in march for about $14.99.